Please email me at gooddogu760@gmail.com for further info on training or any of the events listed below, or to plan your own training event! Daytime competition obedience classes and private lessons offered in Halifax, VT. Please contact me if you would like to join us. Happy training! Incorporating tricks and games into your competition obedience training can radically enhance focus, precision and teamwork at all levels. Whether you’re just getting ready to show in Novice or Rally or are working to keep things fresh for the long haul in Open and Utility, please join us for this fun and active seminar to learn some of the best “tricks of the trade” to keep your dog attentive and energized. Dog and people friendly dogs of all skill levels are welcome. Participating dogs should be comfortable in a group training setting, be food and/or toy motivated & have basic competition obedience skills. Complete formal exercise performance is not required. For complete information and registration details, please click the link below. Please join us for this active, hands on workshop as we explore techniques, games and strategies to train precise, joyful heeling that carries over into the ring. Body awareness, muscle memory, reward strategies (including using and reducing dependence on food), distractions, and setting up for success in the show environment will all be covered. Spring is a time to be on the move after the less active time of winter. So let’s get our dogs moving with some fun action tricks! Tricks covered in this workshop will include: Leg weaves - forwards and backwards; Jumping over legs (or arms); Crawl - forwards and backwards; and Circle the Handler, forwards and - yes - backwards! We also have a Mystery Trick planned if time allows. These tricks are great for strength, balance and flexibility and for overall relationship building between dog and handler. As always, we will help teams get started in tricks that are new and coach those who already have the basics down to take the tricks to the next level. Cost: Working teams - $55, Auditors - $25 Please contact Diane at runswdogs@myfairpoint.com for registration information. Come teach your dog some fun fitness-oriented tricks to keep him/her engaged and in shape! Tricks we'll work on this time include Take a Bow, Peek-a-Boo, Back Up, Wave/High Five and another Mystery Trick - all of which have several advanced versions that more experienced learners can practice. Please click or copy and paste the following link for more info. Engagement - the most important skill of all! Getting and Staying Connected in the Ring! Diane Gibbons of Deep Down Dog Training and I will be teaching a multi-level tricks workshop at the Monadnock Humane Society in Keene, NH on January 16th from 12:30-3:30. Come teach your dog some fun fitness-oriented tricks to keep him/her engaged and in shape over the long winter months! The tricks we cover will include both basic and advanced versions. So, if your dog already dog knows how to spin and twirl, we can add fun challenges such as spins and twirls while moving forward (or backward! ), spins and twirls at a distance, etc. If your dog can "sit pretty" and is also able to hold an object, we can work toward combining the two for a cute crowd-pleasing trick. Each trick we'll cover has an important strengthening or stretching component that will help you keep your dog in shape over the long winter months. Other tricks on the agenda include push ups, leg weaves, sends around a cone and back up. We'll also include a really fun Mystery Trick just to keep you on your toes! Dogs attending should be injury-free and in good health, have good focus in a class setting, be food motivated and be able to follow a lure. Dogs should also be able to work comfortably around other dogs on leash and be reasonably quiet during demo and discussion time (or they will need to be crated in your car. Please bring a chew bone to help with quiet, if needed). 1 - 3: Tricks for FUN! Please contact Diane (runswdogs@myfairpoint.net) or me for details and registration info. 9/26 "Let's Play!" on Saturday afternoon is about building drive and focus by cultivating play with our dogs. 9/27 On Sunday morning, "Focus & Engagement" will address training and maintaining both. "Ring Smart" in the afternoon provides tips, tricks and techniques to maximize performance and joy in the obedience and rally rings throughout a competitive career! Please visit www.tailsuwin.com for details and to register. Full-day of Obedience Workshops at Monadnock Humane Society's beautiful training facility. July 7th - 5 - 8 pm Obedience Fun at Breeze Thru Agility in Brattleboro! 7 pm - CDSP/AKC Obedience Run-thrus ($10) (Note, if lots of people want run thrus, each handler will have a choice of two exercises at any level, adding on if there's time, so we're not there all night :). Space is limited! Please email me at gooddogu760@gmail.com to sign up! Wednesday July 15th, 6-8 p.m.
Southern New England trainers Diane Gibbons and Mary Horne will be offering a 2 hour workshop on teaching Fun Tricks to Build Balance and Strength in Dogs. The workshop will focus on tricks that are enjoyable in and of themselves but also develop our dogs' core strength and balance and stretch their muscles to keep them limber. Tricks such as bow, back up, stationary leg weaves, spins and platform work, among others, will be demonstrated and trained. Dogs attending should be injury-free and in good health, have good focus in a class setting, be food motivated and be able to follow a lure. Dogs should also be able to work comfortably around other dogs and be reasonably quiet during demo and discussion time (or they will need to be crated in your car). Important! If you have any concerns about your dog's health, please obtain your veterinarian's approval before signing up for this workshop. Although the instructors have extensive experience in dog training, neither is a canine physical therapist so please do not come with the expectation that they will be able to analyze your dogs's fitness or structure. Mary Horne has been training dogs (and their people!) in basic skills and manners, therapy dog work and competition obedience and Rally for 15 years. She has titled her own dogs at the highest levels of obedience and Rally and also enjoys training in retriever field work, tracking, agility and, of course, tricks! Fun is the name of the game for Mary and her dogs in all they do. Mary is a graduate of the San Francisco Academy for Dog Trainers, a Certified Professional Dog Trainer (CPDT-KA) and a member of the Association of Professional Dog Trainers (APDT). For more about Mary, please visit her website at vtdoglover.com. Diane Gibbons is an agility and trick dog instructor. She teaches at the Monadnock Humane Society as well as through her business Deep Down Dog Training. Her dogs have titles in agility, rally obedience, and trick dog, and she also enjoys training in treibball and disc dog. Her interest is in active sports training for building a great relationship between dogs and their people. She is a graduate of the Karen Pryor Academy of Animal Training and Behavior, and is a Certified Training Partner (KPA-CTP). She is all about positive training and having fun with your dog. Competition Obedience, Beginning Rally Obedience & MORE at Camp Gone to the Dogs in beautiful Southern VT! Full summer Camp schedule available on the Camp Gone to the Dogs Facebook page. Fall schedule at www.campgonetothedogs.com Update: Camp was a blast! I'm still recovering. Great students, wonderful instructors, amazing food and lots of grand memories. Can't wait until next year! Precision Heeling for Obedience and Rally (working spots FULL) Position, handler footwork and other cues, turns, pace changes and reinforcement will be addressed in this active, hands-on workshop. Come improve your heeling and your scores in Rally and Obedience! Update: What a wonderful time I had with an amazing group of dogs and handlers at the Precision Heeling workshop. Bravo everyone! You made so much progress, and kept those pups' tails wagging throughout. Thanks so much for being open-minded and willing to try new things! Advanced Skills for Competition Obedience and Rally - Part I (working spots FULL) Foundation skills for Open/Utility and Advance/L2 and Excellent/L3 Rally, including retrieve fundamentals (marking, sends & returns), distance work, drops/signals down and directed jumping, will be covered using motivational techniques that are fun for both dog and handler. ﻿January 24th, 2015 - Two Workshops in Brattleboro, VT! Attention and engagement between dog and handler are core skills basic for success in life as well as dog sports. 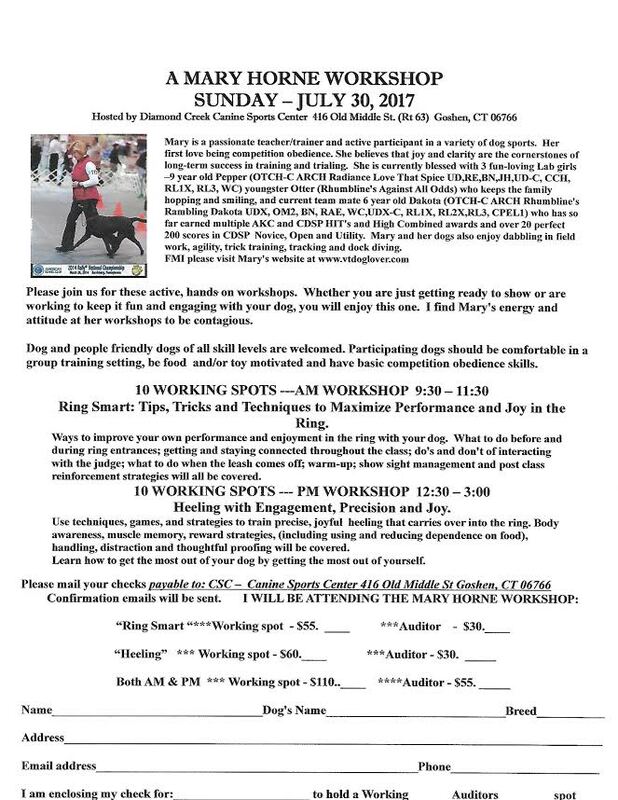 This workshop will take skills presented in last October’s workshops to the next level, and include lots of ring time working your dogs. Using fun motivational training techniques, we’ll build on success to enhance attitude and enjoyment at both ends of the leash as well as remind our dogs that controlling themselves (as opposed to our controlling them) has value. Handlers will play with a variety of proofing techniques to ensure understanding and enhance reliability. Obedience Ring Ready! – Tips, tricks and strategies for performance success at all levels (FULL) 1:30 – 3:30 p.m. Success and true enjoyment in the competition obedience ring of any venue involves much more than teaching and practicing the required exercises. Outside of the formal exercises, the details of ring performance are often overlooked as a skill set until a team fails to qualify or reaches Open or Utility, where such details become more critical as the complexity of tasks and length of performances increase. We will examine and practice subtleties in ring performance that will improve teamwork, animation and confidence for both dog and handlers at all levels of competition. Entering the ring, taking off the leash, and staying connected between exercises will be covered, and trial day routines, effective warm ups and post-performance reinforcement strategies will be explored, as time allows. All of these concepts can be applied to the Rally ring as well. "Dynamic Heeling for the Distracted Dog" & "Fabulous Fronts and Fantastic Finishes"
Please click HERE for a link to the MHS flyer for details and registration form. These motivational workshops are for friendly dogs (and people!) of all ages and skill levels who have an interest in or are already competing in Obedience, Rally, Agility, Field Work and more. Attend either or both! Attention and engagement between dog and handler are core skills that underlie success in most all dog sports. This workshop focuses on fun ways to teach, advance and proof attention skills, both up close and at a distance, and further engagement between dog and handler. Using fun motivational training techniques, we’ll build on success to enhance attitude and enjoyment at both ends of the leash. Start-line stays, waits and stays for obedience and Rally, steadiness in the field … they all come down to one key thing: impulse control! In this workshop, we’ll remind the dogs that controlling themselves (as opposed to our controlling them) has value, and then we’ll play with a variety of proofing techniques to ensure understanding and enhance reliability. Please note: to maximize everyone’s learning experience, dogs must be comfortable working around other dogs and be quietly crated, held by the handler’s side or safely in cars, weather permitting, when not working. obedience retrieves); the U﻿tility Signal exercise (also for Rally Excellent/Level 3); and effective ring practices to boost your performance (and scores!). 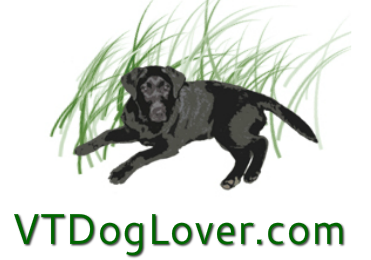 Experienced and green dogs (and handlers!) alike are﻿ welcome. and more! Experienced and green dogs (and handlers!) alike are welcome.